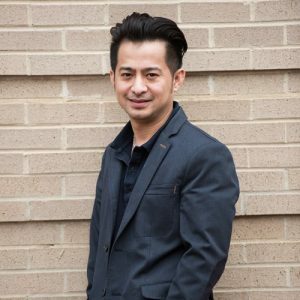 Vincent moved to the United States from Vietnam in 1990, and from that moment on, he knew being a stylist was his calling. So many years later, he still loves creating chic, effortless styles through cut, color, and highlights. Active and always on the move, Vincent loves challenging himself and expressing his creativity in the salon. He also loves that his creativity helps his clients look great! Vincent is well-known for his precise, stylish short cuts. Having taken classes from Vidal Sassoon and others, he’s constantly on the lookout for new techniques and styles. When he’s not in the salon, he loves to vacation with his wife and kids and spend time on his other great passion – sports (especially football)! Speaks Vietnamese.